It’s a full-body workout. It’s also a cool workout that’s a lot of adrenaline-based fun. Cool, because you’re splashing in water the entire time. Adrenaline fun, because you’re sliding, sometimes at speeds of 30 miles an hour, down smooth, plastic slides 70 feet high. Full body, because you have to climb stairs to get to the top of those slides and then use your core on the way down, especially when you hit the water. Plus, you’re outdoors, under the blue sky, which sure beats an elliptical inside a gym. Seven Peaks water park—formerly Raging Waters—has a selection of water rides that allows you a choice of workouts. You can walk the Amazon River, using the resistance of waist-high water to work your abs and hip flexors. You can jump the wave swells in the Tidal Pool to increase your plyometric ability without stressing your joints. Or (my personal favorite) you can choose from the varied selection of slides—steep and straight, or slow and twisting. Clear plastic tubes are used on all rides except for the two steepest, Thunder Gorge and Lightning Falls, at the far end of the park. There, you’re provided with a foam mat on which to slide. Brand-new mats made of a fast, dense foam were put into use in the past few weeks. The two steep slides are a great exercise in controlling adrenaline. When you hit the vertical drops, you’re actually in free fall. It’s a great way to work on the fear factor if you’re involved in a tough action sport like BMX or halfpipe snow riding. These two slides are good practice for any sport where air time is involved. Of the less-steep slides, the orange slide is the longest; it’s a slow and mild twister that can be used for a full-core workout. Practice sliding with your feet pointing down the slide, riding in the middle and not up the sides. Your obliques (side abs) will feel it the next day. The tubes are lightweight, but awkward to carry. If you enjoy this great hot-weather workout and decide to come back often, be sure to switch off sides when carrying the tube; don’t always carry it with the same arm or on the same side of the body—work your muscles on both sides. Work your arms and upper back by swimming or walking in the Amazon River or in the Tidal Pool when the wave machine isn’t going; when it is, get a great calf workout by walking out to where the water is deep enough to come up to your neck, stand on your toes and jump the waves. But it’s easy to overdo yourself at a water park; you may not realize how much of a workout your body is getting. Take a break about every hour; if you feel any stress in a joint or muscle, call it a day. There are 16 water attractions, counting the kiddie rides. You can bring the family, and there’s even a shaded picnic section outside the water park where you can bring your own food and eat. No outside food is allowed inside the park, but there’s a fairly decent hamburger for $3.95. 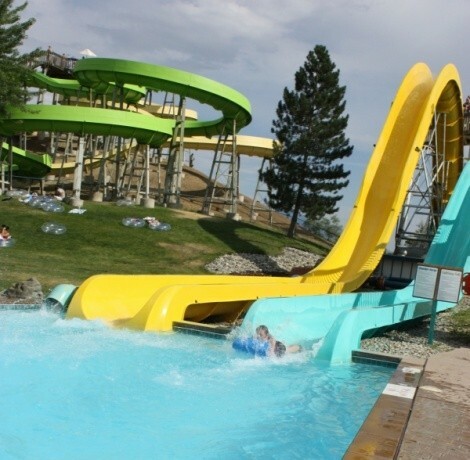 There are two Seven Peaks water parks: in Salt Lake City at 1200 W. 1700 South, and in Provo at 1330 E. 300 North. And now for the drawbacks: Yes, of course, you are in water that, while chlorinated, is still full of many people’s sweat. So what? It’s an “ewwww,” but you can forget about that fact quickly. Second, if you don’t have a season pass, Seven Peaks can be expensive. Admission is $24.95, tube rental is $5 and parking is another $5. It’s much more economical to purchase a season pass. A “basic” pass is $49.95, but one that includes tube rental and parking is $79.95. After three visits, that pass will have paid for itself. In 90-plus degree weather, it’s more than worth it.